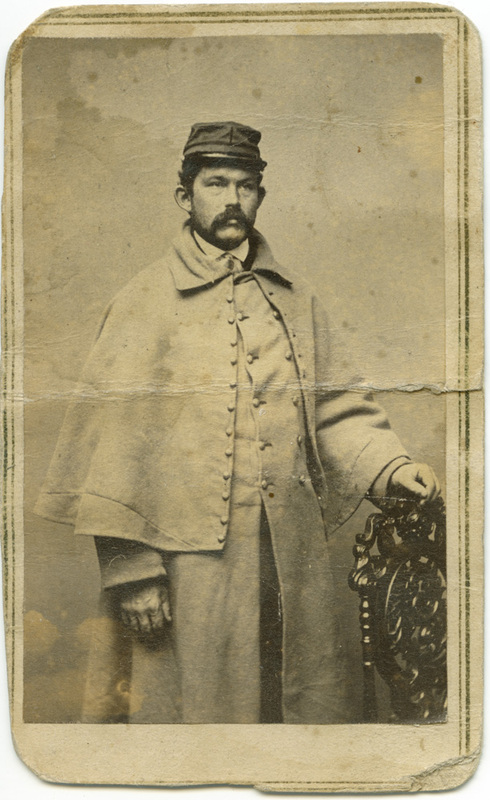 Here’s a Union soldier, identity unknown, from the William J. Tait studio. This may well have been taken immediately prior to shipping out to battlefields unknown – the studio address is Courtlandt Street and Greenwich Street in lower Manhattan – basically in the site of the modern World Trade Center. Back then it would have been only two or three blocks from the waterfront piers. It’s another image that obviously meant a lot to someone as it has a fold across the middle – someone was carrying it around with them in a pocket. Did the sitter die in combat, or was it just a fond memory of a critical time in US history that inspired the owner to keep it at hand? 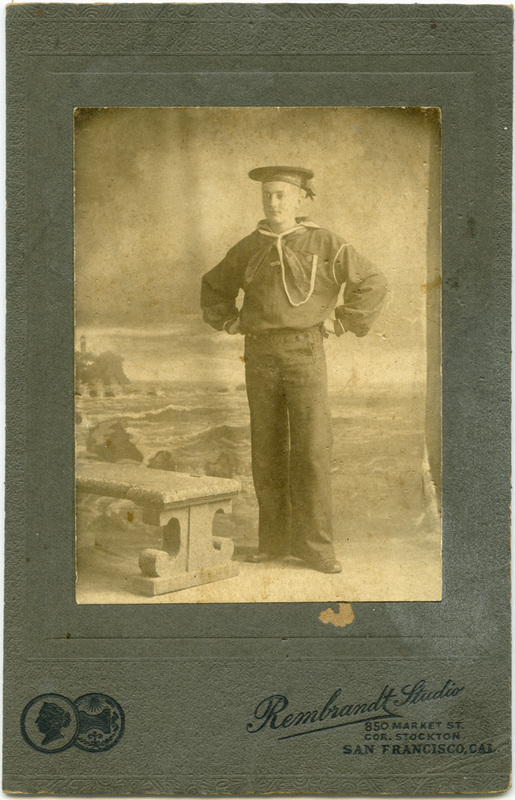 In a totally different light, here’s a west coast sailor. This time, most likely the 1890s, on a cabinet card. The original card is a little bit bigger than 3.5″ by 5″. I did a very mild clean-up of the scan in Photoshop to make the image more readable online. The original card is slightly lower in contrast and has a couple very minor spots in the background that do not interfere with the subject. I tried to scan his hat at high resolution to see if I could read the ship’s name he was assigned to, but it couldn’t be resolved (at least not with my scanner). There’s a noticeable difference between the two photos, and I don’t think it is just attributable to the changes in photo technology between 1860 and 1890. The Civil War sitter has a far more somber expression on his face and in his body language – it’s as if he knows he is going to die, and this is a reminder to send back to his family so they won’t forget him when he’s gone. The 1890s sailor, on the other hand, is having a lark, getting his portrait done while in port perhaps as much a souvenir of the location as anything else. Later I’ll re-scan and post my Hong Kong sailor photos to provide a comparison. I find the civil war photos very melancholic and I’m not even American! I think your interpretations of the photos are always interesting and thought provoking. Looking forward to more, as always.